My husband just asked where the stamps were and I proudly walked him over to our new organized junk drawer. 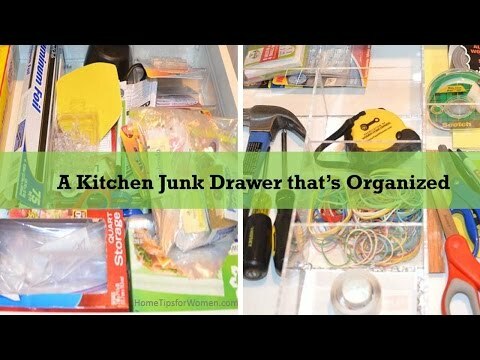 Do you have a junk drawer in your kitchen, and maybe a few others in your house (bedroom, bathroom or home office)? Sometimes you need to hide your clutter when entertaining, but how often do you remember to retrieve things and put them away after the party? With an organized junk drawer, it's a lot easier to put things away right after you use them … and find them too. This story started when I saw the drawer displays that OrganizeMyDrawer.com brought to the International Home Builder’s Show. I stopped to learn the story behind them and they offered to give me one drawer to review … but all comments here are my own. OrganizeMyDrawer.com is a new company, founded by Andrea and her retired military husband Wayne. Like me, Andrea has move a lot, and getting each new house organized is one of her hot buttons. Her husband happened to have some cool laser tools in his workshop, so Andrea asked him for help. What began as a project to organize her kitchen, gave birth to a business you'll love, Organize My Drawer. How to Organize Your Kitchen Drawers walks you through the decision process I used to decide what I wanted to keep in my kitchen junk drawer. Designing an Organized Kitchen Junk Drawer then shows you how I grouped things into the compartments I wanted, measured and plugged my numbers into the design tool. At first I assumed that designing my drawer would be a snap, but it wasn’t. Here's a quick summary of the steps I followed and if you want the details, check out the articles above. There’s also a bit more pressure because you’re making decisions, that once made (into the acrylic drawer insert) can’t be changed. Left my kitchen junk drawer open for about a week, to decide what I wanted to keep there. Took the things remaining in the drawer, and laid them out on the countertop. Started moving things around to see what items could share compartments, like scissors, tape and pens in one long, narrow compartment. Transferred measurements over to OrganizeMyDrawer.com's online design tool. Printed the design and checked the measurements for the critical items, to make sure they were big enough. Good thing I did this because initially, the space for the hammer was too short. Submitted my design … and waited. It only took a few days for my acrylic drawer insert to arrive, and it was well packed. You'll have to watch the video to see me unpacking it, and don't laugh too hard as we sped up the video. We've had our new, organized junk drawer for about a month … and I love it. You might think I'm not using the space as well as I could and that might be true. What I can tell you is I'm not wasting any time hunting for buried treasure in my junk drawer. When I open the drawer, I can see everything that's in there which makes it much easier to grab things. The magic to getting (and staying) organized is creating a place for everything. When you do this it’s much easier to put things away, and then you know exactly where to find it when you need it. This is especially important for the tape measure and hammer I like keeping in my kitchen for small projects. Of course I've now got to show my husband where the tape measure goes in the drawer, and give him credit because it was in the organized junk drawer. Where do you have junk drawers in your house? That is so exciting! A custom drawer organizer. That makes me beyond happy! I’m spending the next rainy Saturday designing my perfect layout! Thanks for this information.